I have coveted Jil Sander's maxi flourescent skirt ever since I saw it from its S/S 2011 collection for its minimalistic appeal. On the day that I planned to buy a fabric to DIY it, I guess luck has stirred me to visit a thrift shop and lo and behold, I saw a similar skirt on a rack for less than a dollar! And I guess I would have never finished sewing it myself, if I ever did one, because of my poor sewing skills hahaha. I see myself wearing this on an intimate party with friends and I'm loving the unexpected hint of leg because of its side slit. How about you lovelies, what do you think of this trend? I would love to hear from you. p.s my giveaway starts on my next post! stay tuned..
wow, is amazing I love all you and the photos!! That is one gorgeous skirt! It really shows off your fabulous figure, too. Oh Cherie! that's my kind of blue! lovin' the first pic! hey, thanks for the comment. i'm excited to own my very first flourescent item. i'm not really sure how it'll look on me but we'll see how it goes :) congrats on a great buy. 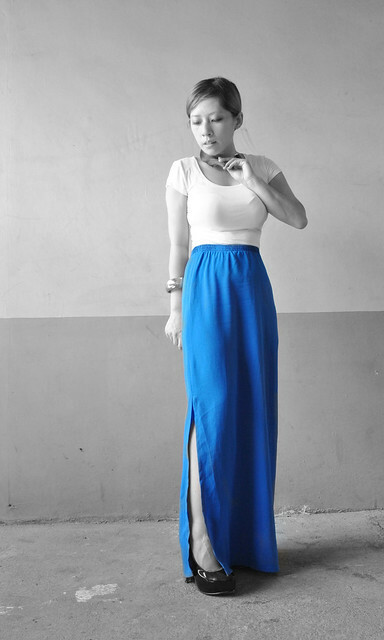 Love this maxi skirt ! necklace na lang ang kulang, pwede na! So chic, now I want a skirt haha!!! I think I would try it! the semblance from the original is uncanny...it is indeed a great find. And the fit is doing your beautiful body great justice. love love! whoa! i am totally loving the color of that maxi skirt...i need to find me brighter ones...on my next thrifting trip, for sure! whehehe yes for your giveaway!!! i really did thought of Jil Sander's orange skirt when i saw ur blue version (before I read ur text)..
the blue one here is just a fabulouss !! girl, i am loving your rendition of Jil Sander's maxi skirt! the color is amazing, i love that blue. i've been thinking about a DIY too, this is definitely making me want to do it even more now! something maxi is always good. I especially like maxi skirts:) now still in a need of a maxi flowy dress. love the whole outfit! 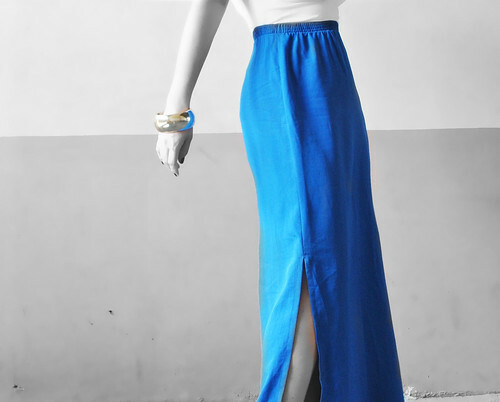 and the blue maxi skirt, so fabulous! I made a Jil Sander inspired skirt lol love your skirt though sugar how lucky are you!